Spending Money features great money graphics with options for US or Canadian currency, scanning capabilities, and choosing the number of items on shopping lists. In Spending Money, users browse through eight stores in a "money mall" and buy products like sweaters or soft drinks. They select appropriate bills and coins to pay for the items and then they receive change back. Separate exercises let users practice their money handling skills, with the teacher choosing if the student pays with coins or bills and if the exact amount is required. In the shopping option, the teacher decides how much the student has to spend. United States and Canadian currency is included. Software is mouse, touch screen, and switch compatible. 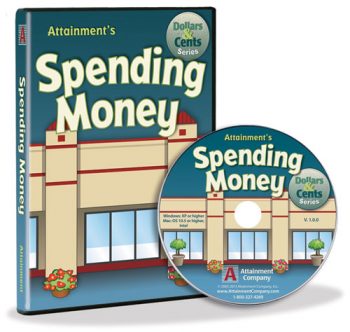 Spending Money is part of our Dollars & Cents Software that also includes Counting Coins and Making Change.